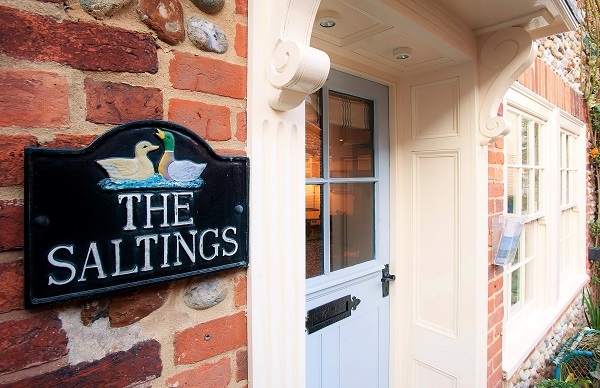 The Saltings is a gorgeous old fisherman’s cottage, renovated to a very high standard, nestled in one of Blakeney’s prettiest ‘lokes’ or courtyards. 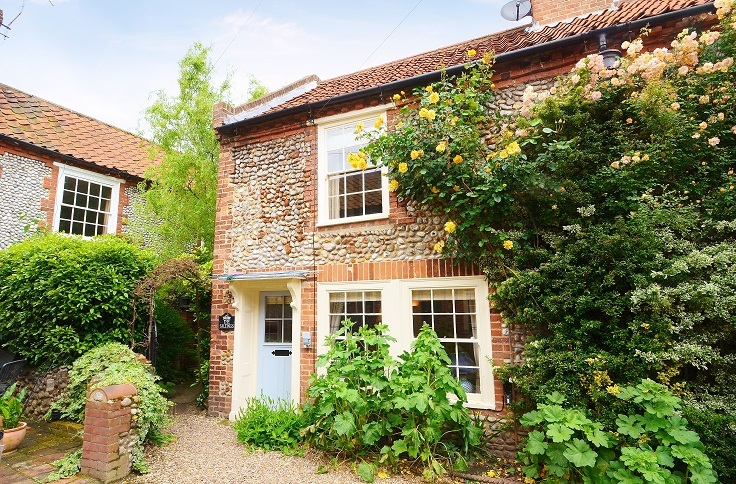 Right in the heart of the village, this lovely property is just one minute’s walk to The Quay and near to the many amenities Blakeney has to offer. One enters the cottage from the loke into the open plan ground floor sitting room which leads through into the kitchen. The sitting area is very pretty with two comfortable sofas facing the large log burning stove and a round pine dining table with six chairs in front of the window. The interior feels very light and airy with the soft furnishings all coordinating in natural fabrics of soft coastal plains and stripes. There is Internet/Wi-Fi, FreeView TV and a DVD player and tucked away in an alcove next to the fire place is a great selection of reading matter for cosy evenings in. For the audiophiles among you there’s a Roberts Blutone sound system which allows you to stream from your phone or tablet, as well as offering DAB or FM radio and a CD player. The attractive kitchen is well equipped and lined with hand-painted, bespoke cupboards. There is a large, double-oven stainless steel stove with halogen hob and, beneath the tiled work surface, a washer/drier, fridge, freezer and dishwasher. Along with all the usual appliances are a microwave and Nespresso coffee machine. 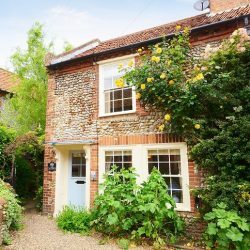 The thoughtful owners have matched the need for all modern conveniences without compromising the charm of this delightful cottage, and have even managed to fit a handy cloakroom on the ground floor. Stairs lead up to the first floor where there are two lovely bedrooms and bathroom. The main double bedroom is again delightfully furnished with a double bed, large wardrobe and drawers. Stairs from this room lead up to a twin bedroom situated on the second floor in the converted attic. The main bedroom can be separated by a curtain if the attic bedroom is used. The first floor twin room has a large chest of drawers, hanging space and two 3ft small single beds facing each other across the room. The cottage is ideally suited for 4 people but if guests wished to use all the bedrooms there would be a small extra cost for the extra guests. Do phone our office on 01263 741777 if you would like to book an extra bedroom for more than 4 staying. The bathroom is situated on the first floor and has a roll top bath with shower above, wash basin and WC, again all coordinating with the pretty cottage design. The cottage has electric central heating and is cosy all the year round. With its original wooden floors it is ideal for holiday-makers wishing to bring well-behaved dogs but of course house rules apply: no doggies on the furniture or in bedrooms please! With its lovely situation just yards from the Quay we know The Saltings will be on everyone’s list as a favourite bolt hole, so we suggest booking early to avoid disappointment!